Photos from 2019 Moose Chase HERE. 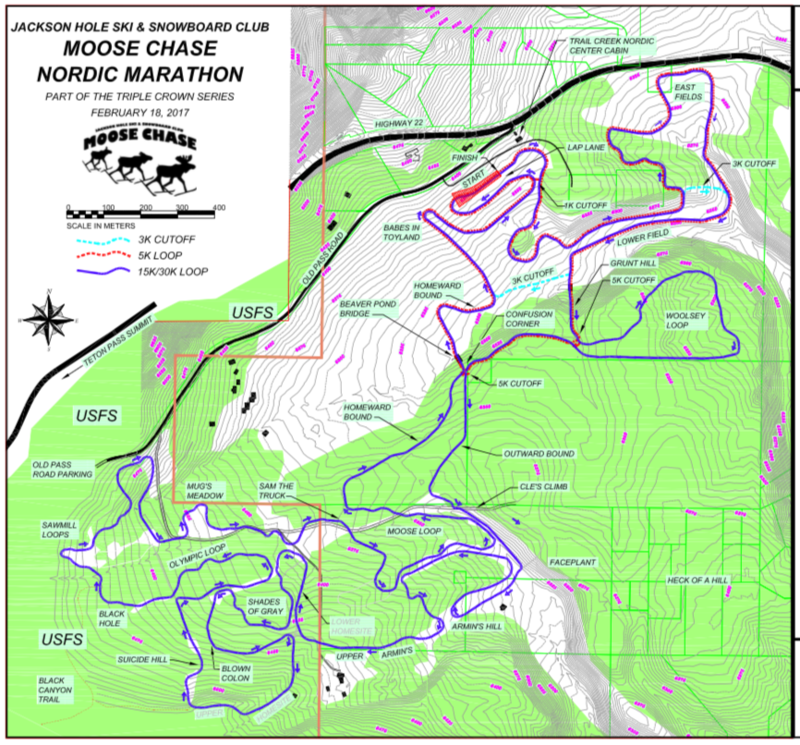 The Jackson Hole Ski & Snowboard Club is proud to present the 27th Annual Skinny Skis Moose Chase Nordic Ski Race at Trail Creek Nordic Center in Wilson, WY. This premiere Nordic race includes a 30k, a 15k, 5k, 3k, and a free 1/2k. Competitors can skate or classic ski the course. The Moose Chase is the first event of the JHSC's Triple Crown Series. Register early for best pricing! Bib pick-up will be Friday night at Skinny Skis from 4-7pm. Bibs will also be available Saturday morning at Trail Creek from 8:30am - 9:30am. If you plan on picking up your bib Saturday morning please allow additional time for the shuttle to Trail Creek. Please turn in your bib after the race. Please select the appropriate wave assignment for your race. Wave assignments alleviate congestion on the course and give all skiers an opportunity to ski their best race. Wave assignments are for 30K (Elite, Competitive & Recreational) and 15K (Competitive and Recreational) racers. Early Bird Registration Rates will save you up to 17% on entry fees! Sign up before 1/1/2019. Online Registration Deadline is February 14th, 2019. Registrants can also sign up at Skinny Skis on February 15th, 4-7pm, late registration rates will apply. We are always in need of volunteers to assist us with this grandfathered community event. If you plan to spectate at the event, please consider donating your time by volunteering! If you have any questions about the Moose Chase volunteer positions, please contact Brittney Ziebell. Inspect the course on Friday - free with your Trail Creek season pass or $15 for a one day pass. We will be using chip timing this year. Transponders must be worn on your left ankle. Please return your bib and transponder at the end of the race. At the start area there will be marked sections for each distance. The race will start and end at the same location this year. Rough GPS of the tentative course. For those of you familiar with the course at Trail Creek, a reminder that we do not have Gut Flop in the course. Trail Creek Nordic Center does not have an indoor warm up area or lockers for gear storage. Port-a-john restrooms are available. All competitors in the 3K will receive a special candy pack when finished up by the cabin! Thanks to Yippi-i-o for their donated treats! All competitors in Bob's Mini Mini 1/2K will receive a special lollypop when they cross the finish line! Thanks to Yippi-i-o for their donated treats! There is limited racer or spectator parking at the venue. Please use the Stilson parking lot and enjoy our free shuttle to Trail Creek Nordic Center. Shuttles will travel between the Stilson lot to Trail Creek STARTING AT 8AM. Please allow at least 30 minutes for the one way trip. The shuttles will pick up just south of the restroom facility at Stilson. Look for the bright pink signs. Located at the Northwest corner of Hwy 22 and 390 in Wilson, WY. - If you are coming from Teton Pass (east on Hwy 22) the parking lot will be on your left before the Hwy 22 & Hwy 390 intersection. If you pass the lot and get to the intersection, turn left at the light and then take your first left into the parking lot. - If you are coming from Jackson (west on Hwy 22) the parking lot will be on your right after the turnoff for Teton Village (Hwy 390). The Start Bus stops at the Stilson parking lot as part of their route to Teton Village. There are many places in the town of Jackson to board the Start Bus. - If you are coming from Teton Village (Hwy 390), the parking lot will be on your right before you reach Hwy 22. The Start Bus stops at the Stilson parking lot as part of their route to the town of Jackson.